Bloody beaver at it again? Dammit! With the Beaver Dam! In the world of menstrual cups, there are two basic kinds: the cups from reputable companies, and the cheap cups that are mostly made in China. 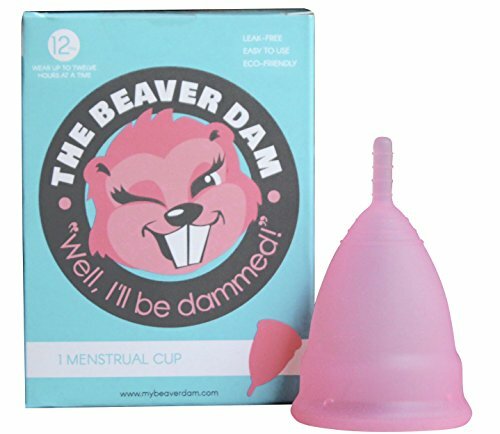 What about the Beaver Dam Menstrual Cup? It seems to be another one of the cheaply made cups from China. Although the company does have a Facebook page and basic website, there is very little information about the cup besides that. We’d love to know more about where the cup is made, the sizing information, etc. Basic stuff! The Beaver Dam menstrual cup is a newcomer to the eco-friendly period products world. It’s got a cool name, but is the product a good one? It’s hard to tell. There just isn’t that much information about the product on Amazon. There are a few reviews, but they’re a bit over the top and don’t really provide an accurate picture of the pros and cons of the Beaver Dam. It might be worth a try? Or, it might not. For our money, we’d probably stick with a cup that’s been around for a whole lot longer (The Mooncup for example is an excellent one to consider). It’s a few bucks more, but you’ll probably be a whole lot happier with it. It just works well! There are two sizes: small and large. As for the dimensions, we were unable to find this anywhere online. This seems to be the most basic of oversights on the part of the company. Who should use each cup? The small is for younger people who haven’t given birth vaginally. The large is for older people and/or someone who has given birth vaginally. For a menstrual cup that seems to be very cheaply made in China, branded with a cool name and then sold on Amazon, it’s very expensive for the consumer! We HATE menstrual cups with very little information about them. The Beaver Dam lacks even the most basic information such as sizing, capacity and dimensions of the cup. Also, where is the cup made? And why does the company have a website, but with bad links, no information, etc.? Menstrual cups with very little information about them, including sizing are not a win in our books! Instead, we recommend a higher quality menstrual cup from a reputable company. One of our favourites is the Lena Cup. 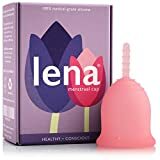 It’s made in the USA from medical grade silicone and the company is committed to putting a Lena Cup in the hands of as many people as possible at a very reasonable price. There are two sizes: small and large, as well as two firmness options (regular, and soft). You should be able to find the Lena Cup that works for you quite easily! Most people who use this period cup seem to love it. The product has some of the highest user ratings on Amazon in the category. It’s easy to insert, as well as remove. Most people find that it just snaps into place easily and doesn’t leak for them. It’s a serious win and you’ll probably love it! Beaver Dam Cup: Have your Say! What do you think about this new period cup? Is it a win, or are you considering another brand of menstrual cup?